Then newer, brighter toys came into the toybox. They had special tricks. Some could move when the Boy pushed a button. Others bounced high. Velveteen Rabbit had no special tricks or buttons. No wonder the Boy started to choose these other new toys. "And when soft toys get loved and loved, we can become Real." This all sounded fine to Velveteen Rabbit. But how could that ever happen as long as Velveteen Rabbit was stuck in the toy box? After all, the Boy was playing with toys that could do special things. One day Nana, who took care of the Boy, flew open the lid of the toy box. She said in a busy tone, “Oh, dear! That walking doggie is missing. I must find something else for the Boy!” In a second, Velveteen Rabbit was plopped down onto the bed with the Boy. This began another happy time for Velveteen Rabbit. Each night the Boy would hold Velveteen Rabbit close in his arms. In the morning, the Boy would show Velveteen Rabbit how to make rabbit holes under the sheets. If the Boy went outside to a picnic, or to the park, Velveteen Rabbit would come with him, too. One day the Boy became sick. His forehead got very hot. The doctor came and went. Nana walked back and forth in fear. Day after day, the Boy stayed in bed. There was nothing for Velveteen Rabbit to do but to stay in bed, too, day after day. "That old thing?" said the doctor. "It's full of scarlet fever germs Burn it at once!" But the gardener was too busy with picking the beans and peas before nightfall, so he left the sack behind. “I will take care of it tomorrow,” he said. The sack was not tied at the top, and Velveteen Rabbit fell out. The next day when the gardener picked up the sack to take it away to be burned, Velveteen Rabbit was not in it. Then it started to rain. Velveteen Rabbit was sad. So far away from the Boy, never again to be nice and cozy together, and now soaking wet! A tear fell from Velveteen Rabbit’s eye, over his cheek. It plopped onto the grass. All at once, at the spot where the tear fell, a flower grew up. Then the bud of the flower opened. A tiny Fairy! 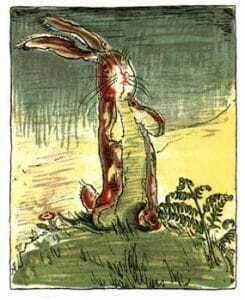 “I think I remember Real,” said Velveteen Rabbit. Now, what was it Cowboy Horse had said? Ah yes. When you are Real, you can move when you want to move. If you are loved, you can love back. With one touch of the Fairy’s wand, Velveteen Rabbit felt different. Tickly. All of a sudden, each one of its two legs sewn together tight, could move! A fly landed on Velveteen Rabbit’s head and it was itchy. As quick as a wink, that foot was up at the Velveteen Rabbit’s head to scratch it off. With one touch of the Fairy's wand, Velveteen Rabbit felt different. Time went by. The Boy was back from the shore. He was all better now. One day, the Boy went to the backyard to play. From the trees nearby, a few rabbits hopped out. One rabbit was brown all over, and another one was all white. A third rabbit had brown spots, most of them faded. That one hopped the closest to the Boy. The Boy thought, "Why, this rabbit looks just like my old Bunny that was lost when I was sick. I loved that Bunny!" The Boy had to say goodbye to Velveteen Rabbit. 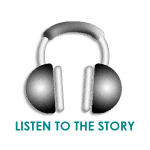 Tell about a time when you had to leave behind something or someone that you loved. Velveteen Rabbit came back to the Boy at the end. Tell about a time when something came back to you that you loved. This story has been adapted from "The Velveteen Rabbit (or How Toys Become Real)" written by Margery Williams (also known as Margery Williams Bianco) and illustrated by William Nicholson (1922). It chronicles the story of a stuffed rabbit's desire to become real through the love of his owner.